We’re easy to contact: Find us 24/7 on the phone, by filling in our contact form or just type directly into the chat box on any page of this site. Your free quote is based on an hourly rate: Book the hours you need, as often as you need them. Benefit from discounts for other services: Add window cleaning, carpet or oven cleaning to your usual work and you might be offered a reduced rate. Book your cleaning for any day of the week: There’s no extra charge for weekend services. Once your service is in place you’ll get a regular cleaner: But when they’re away we’ll arrange replacement cover if you want it. Judge us by our results: When you’d like to check us out before setting up a regular service book a one-off cleaning session. Ask us to hold keys: We have secure systems in place to do this and you’ll never have to hang around for your cleaner. 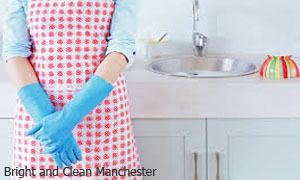 Regular tasks: Vacuum cleaning or mopping floors, cleaning kitchen sinks, wiping down all work surfaces and appliances. Cleaning bathrooms including all fixtures and fittings, disinfecting toilets, polishing and dusting through your home. Wiping down doors and contact switches. Making or changing beds. Rotational Tasks: Emptying fridges or freezers, cleaning, de-frosting and putting everything back. Cleaning out store cupboards. Scrubbing tiles and grout in kitchens or bathrooms. De-scaling taps, cleaning filters in dishwashers or washing machines. Internal window cleaning. Optional Extras: Washing up, putting laundry through the machine, ironing and anything else that can be done without the use of specialist cleaning equipment or products. Speaking of products, your cleaner will use your own supplies, or for a very reasonable price we’ll arrange to deliver a package of eco-friendly, non-toxic detergents to your home. Letting strangers into your home isn’t something we expect anyone to do lightly. Don’t worry. Your cleaner may be a stranger to you but we know exactly who they are. 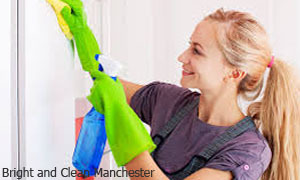 All staff who deliver house cleaning in Manchester undergo a rigorous ID and reference vetting process. After that they’re trained in cleaning techniques and instructed in their responsibilities as key holders. Finally we maintain an ongoing quality control program, to make sure you get value for money each and every time you use our service.